The Fall 2015 collection from HONOR by designer Giovanna Randall evoked the 1960s, from the Moody Blues 1967 hit "Nights in White Satin" to thick headbands and bishop sleeves. 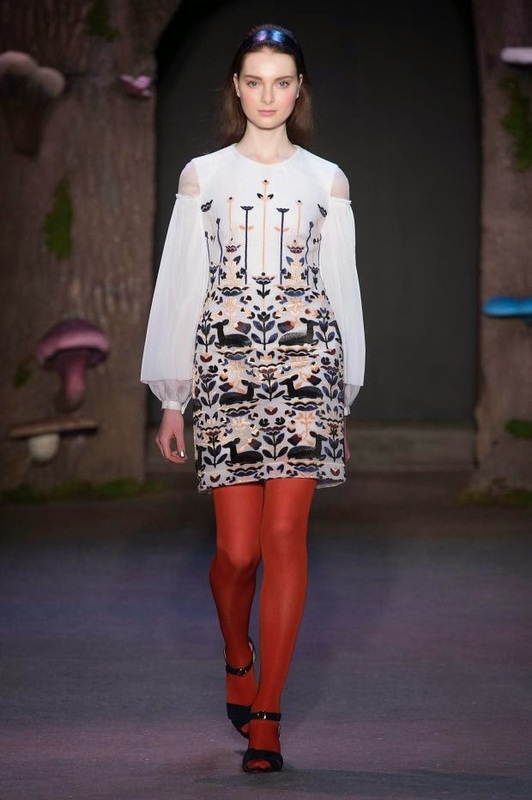 The mod-femme vibe was mixed with a psychedelic wood with Willy Wonka style mushrooms sprouting from an enormous tree trunk that served as runway entrance and the design house's logo. Each piece was paired with brightly colored opaque tights in reds, purples, blues and greens and low, chunky-heeled sandals. The hair was styled into a flip reminiscent of Mary Tyler Moore and pulled back with a thick headband. 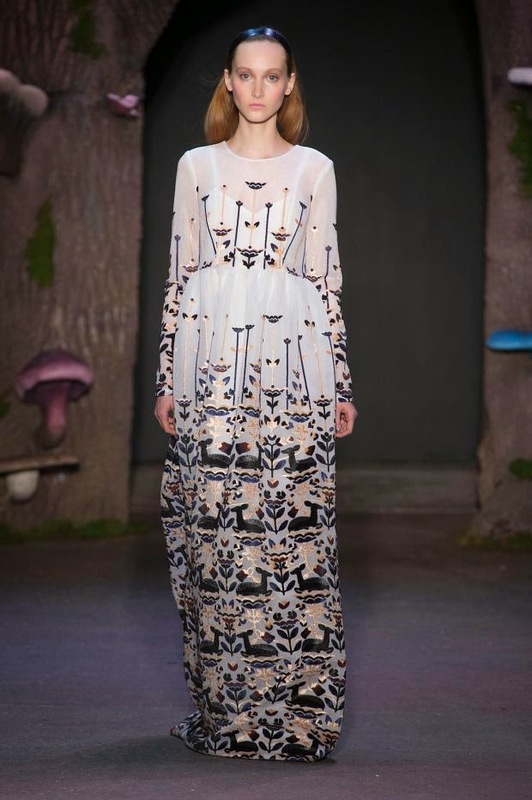 The makeup was dewy and dream-like, giving the models a youthful glow. 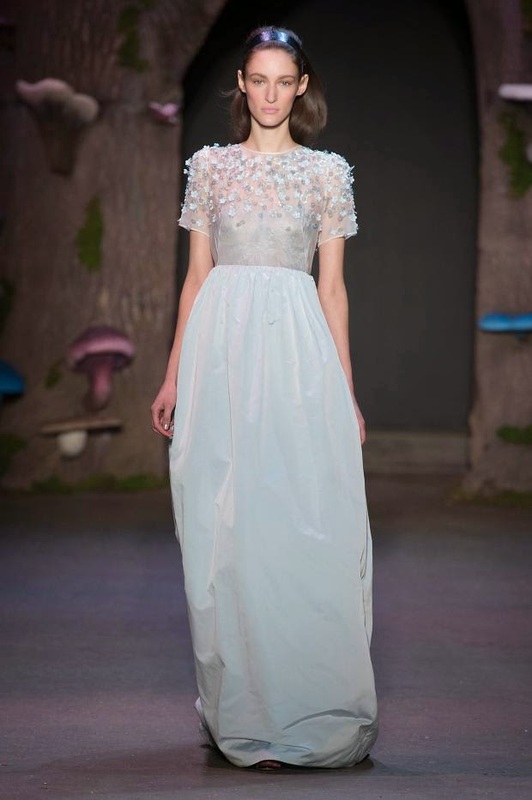 The designer worked with materials like organza, corded lace and devoré velvet. 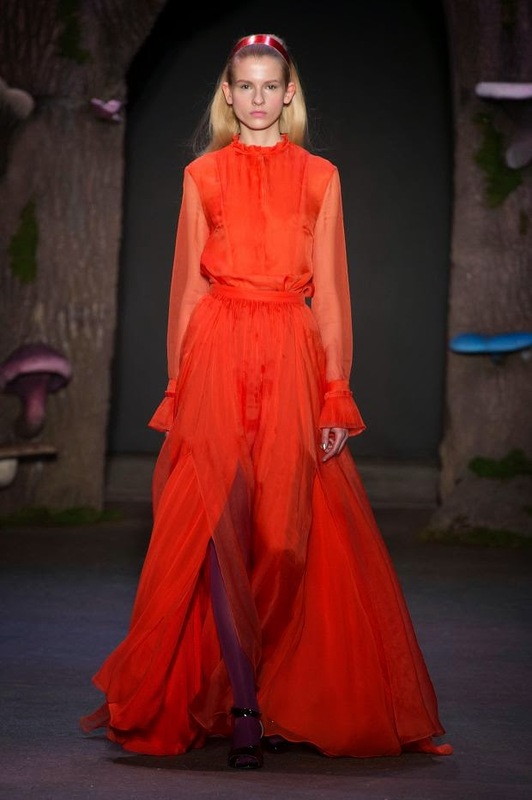 The show featured trumpeted gowns with empire waists in frost blues taffetas, black mikados and white satin organza, wide-legged trousers in orchid (last year's PMS color of the year), and silk blouse with scalloping in tomato (read: vibrant red). Though simple in appearance, almost every piece included some kind of embellishment. Romance and nostalgia are the two words that come to mind when I think this particular label, and they held fast to that theme. Newcomer to New York Fashion Week, Bayarmaa Bayarkhuu brought us a taste of Mongolia’s rich culture with her brand MONGOL. The opening performance juxtaposing a traditional, instrumental, Mongolian musician side by side with a hip hop artist, set the tone of her collection. Bayarkhuu fuses classic Mongolian garments with urban street style. Many of her pieces involve the transformation of deel, the customary tunic or kaftan symbolizing prosperity and longevity, with modern silhouettes of shoulder cut outs , bell sleeves, and capes, in vivid gem tones. Conventional materials such as lamb fur, cashmere, and silk are integrated alongside experimental plastic and leather. While the collection successfully harmonizes tradition and modernity, there are moments where that balance is lost, as when it's masked behind 90's neon pinks and turquoise. But all is redeemed with the styling - chic center parted braids and beaded headbands, which adds beautiful cohesion. The band and brand duo have done it again. On Friday, February 13th, they rocked the Studio at the Mercedes-Benz Fashion Week tents with high-low gowns, a-line cocktail dresses and ultra chic capes. They stuck to their signature rocker-chic look using a variety of plaids (some transparent for that extra bit of edge), furthered their legging fame with an equestrian-style pair, and took inspiration from the '70s with the oh-so-fabulous cranberry red silk-satin jumpsuit. Shoulder pads were in full force for a few of the pieces, most notably a skin-tight transparent number with a deep v-neck. In true Mark and Estel fashion the pair ended their show with a musical performance, complete with guitar solos, funky dance moves, and the repeated proclamation that "[we] are fashion rock stars!" Mark and Estel, you are fashion rock stars.